Sarah Hurley 365 (Formerly Sarah Hurley Challenges): Cloudy Day. Hi, it's Carol here today! Hope everyone is well and looking forward to the new week ahead of them. Exciting times for some of us #TeamHurley girls as we are all heading to Birmingham at the weekend for a meet up...totally hyper in this household...anyway I digress. Today I am going to share a card I made using the stunning new Large Tiger Butterfly stamp, Doodle Home Stamps and Sentiment Stamps. I even got out the Distress Inks and got inky! 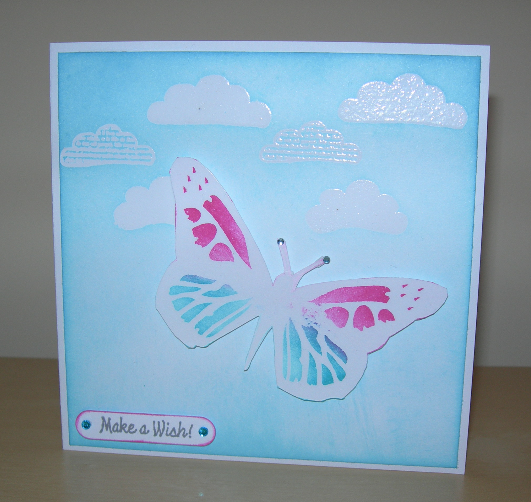 1 Stamp the gorgeous butterfly using embossing ink, cover with clear powder and heat. Take a piece of 5 3/4" square card and stamp with the 3 different clouds from the Doodle Home set, cover with embossing powder and heat. 2 Look out the colours of Distress Inks you would like to use and get inky! 3 Fussy cut the butterfly, add to the card using 3d foam. Stamp a sentiment onto some card, punch it out then distress the edges. I popped some wee sparkly gems on the antennae of the butterfly and the sentiment. Distress Inks; Picked Raspberry, Peacock Feathers & Broken China. Thanks for popping by today, why not have a look at some of the other posts from my fabulously talented teamies, and remember to pop by soon for another new post.